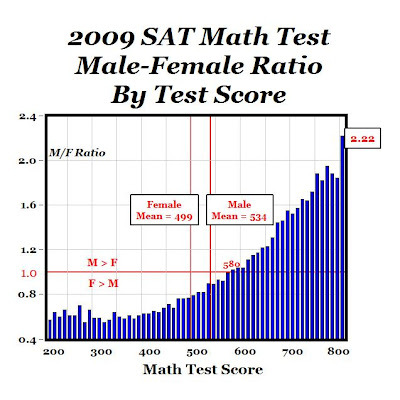 The chart above shows the male-female test score ratio for the 2009 SAT math test (data here). For example, for perfect scores of 800, males (6,928) outnumbered females (3,124) by a ratio of 2.22 to 1. In other words, 69% of test-takers who got perfect math scores were males vs. 31% of perfect scores by females. Or we could also say that there were 222 high school boys who got perfect SAT math scores for every 100 high school girls. The graph further shows that boys outperformed girls at all 23 math test scores between 580-800 (10 point intervals, with male-female ratios of 1.0 or above), and then for math test scores between 200 points and 570, girls outnumbered boys (male-female ratio below 1.0). Further, the graph shows that the mean SAT math test score for high school boys was 534, and 35 points higher than the mean female SAT math test score of 499. And based on data here, the standard deviation of male math SAT test scores was 118 (variance of 13,924) compared to the standard deviation for females of 112 (variance of 12,544), for a Male-Female variance ratio of 1.11. If we are trying to explain the over-representation of males in science, math and engineering departments at MIT and Harvard, especially if that group represents those who score 800 on the SAT math test, the explanation seems pretty clear, convincing and straightforward: males are over-represented by a factor of more 2:1 for SAT math test scores of 800 points. Bottom Line: Can Larry Summers get his job back as president of Harvard, for saying basically the same thing? "It does appear that on many, many different human attributes- height, weight, propensity for criminality, overall IQ, mathematical ability, scientific ability - there is relatively clear evidence that whatever the difference in means - which can be debated (MP: Actually for math SAT scores, there is no debate) - there is a difference in the standard deviation, and variability of a male and a female population." Update: Adjusting for the fact that more girls than boys take the SAT (as suggested in the comments by Dr. T) makes my case even stronger, since 0.974% of boys scored 800 on the SAT math test vs. 0.386% of girls, for a ratio of 2.52 to 1 in favor of boys for perfect math test scores of 800, even greater than the 2:22 to 1 ratio for unadjusted scores (see graph above). Summer’s could Create or Save his old job at Harvard. Yes, that’s the ticket! We need weighted ratios, since more girls than boys took the SAT. You are a heretic and a sexist PIG! But, Larry would advise you to be very, very careful when speaking the objective and quantitative truth in today's political climate. I hope he does not get his old job back. As far as I know he is the closest thing we have to a capitalist in the Obowma administration. Well, now the social engineers will blame this fact on something like the "Class Glass Ceiling" and "Male Math" Teachers. No need to worry about Larry he'll not be among the unemployed. Unlike measuring an external attribute, such as height, weight, eye color, etc., intellectual abilities are not directly observable. Success on a SAT test requires both ability and effort. If there is a societal and cultural bias such that females feel less feminine or attractive if they show high math or science ability or interest, some of the females most aware that they possess above average math and science abilities will attempt to hide these traits to increase their attractiveness and femininity. Similar results will occur if the females believe it is unfeminine to score higher than their desired boyfriends score. Potentially high SAT math and science female scorers will most likely know based on past school test scores that they have the capability to score high on math and science tests. One would expect these previously high math and science scoring females to underperform intentionally (not necessarily consciously), with the greatest underperformance occurring at the highest score levels. It is the highest female math and science score achievers who would have felt the biggest negative effect of the cultural and societal bias against female success in math and science. As female test takers approach the average, they will have had felt fewer negative effects from their previous math and science scores. The high female scorers will have the most motivation to limit their effort and underperform based on their abilities. The SAT score results are therefore consistent with the assumption that there exist cultural and societal factors limiting female achievement in the math and sciences. It is the societal bias that will cause the appearance of an excess of males at the highest test score results and the tampering off as the scores approach the middle. When ever did a female think that a high math SAT score would somehow lose her a boyfriend? If this sort of kowtowing behavior was common in American women, why are so many women demanding, whiney and ever issuing standards and rules--all of which annoy men about 1000 times more than a high SAT score. I just wish I ever met a woman who catered to my needs. It never happened. I cater to my wife's needs. Dr. T: If you adjust for differences in the number of tests, the high end is even more over-represented with boys. For example, 0.974% of boys scored 800 vs. 0.386% for girls, which is a ratio of 2.52 to 1, even greater than the 2.22 to 1 ratio for unadjusted scores. That would make my case even stronger. Hmm... then why does a similar ratio (although to a lesser degree) in the Critical Reading portion not equate to higher representation in English or History majors (or does it)? Also, it might be interesting to examine clusters: are males overrepresented at the high AND the low (as they are in IQ bell curves)? That is, do females cluster more around the average with males displaying greater variability (i.e., more geniuses, more idiots)? Yes, that's exactly what happens. Furthermore if you use a similar test at age 22, when boys/men have matured as much as girls/women, the IQ curve accelerates even more so. Watch any two women who don't know each other, talk to one another, and observe the amount of non-verbal communication that goes on, and make a transcript of it. Add a man to the conversation and watch what happens to their conversation. Listen to any group of men talk about something complex, involving risk, or inter-temporal. Record the meeting. THen bring a woman into the room and observe the difference in their speech. Women empathize with people, men empathize with tools. Abstractions are tools. Women speak in experiences and men in facts. There is no mystery to this difference in evolution. Women tend to think in terms of concrete actions, and likely successes. Men tend to think in terms of boundary conditions, failure points, and the limits of action. While few if any men can understand how a woman sees the world of human interactions. The average woman walking into a room full of people reads a complexity than most men cannot even fathom exists. WHile some women can use tools to understand spatial concepts, few if any can even fathom how men view space and time - some of us see the spatial world of our minds more vividly than the space around us, and most women are as blind to this richness as we are to their empathic richness. Women seem to be able to hold attention on repetitive tasks much longer than can men, on average. The data appears to be quite clear. While some women CAN excel in certain abstract areas, in large part, they fill the 'middle ground' everywhere in civilized life. Examples of the performance of lawyers and doctors are fascinating, as are financial professionals. Compare that to the success of women in medical sales, or sales related activities. Women fill the middle ground, where detail is more important for execution, but theoretical constructs and innovative strategy are not. Men fill the bottom, and the top, as they do in most professions, and they do so because IQ variation among men (who are specialists) is greater than IQ variation among women (who are generalists), and women push men out of the jobs that are clerical or communicative, into those jobs involving risk or theoretical capacity, at which men have less reluctance and women significant reluctance. The fact is that extraordinary women in academia, aside from the rare exception, specialize in empirical research which can explain experiences that are open to direct perception, and extraordinary men specialize in theoretical research that requires tools and abstractions in order to perceive increasingly abstract concepts. Above 140 IQ, and we must acknowledge that pattern recognition above 140 begins to be difficult to test, the universe becomes almost exclusively male. Men empathize with abstractions and tools, women with experiences and people, and these minor preferences, over a lifetime of experiences, considerations, internal debates, and judgements reinforce these tendencies. He lost his harvard job for stating what all of us know from experience and has been confirmed by the data: Exceptional men excel at abstract concepts, and there are either few or no women that approach these abilities. And even if they possessed the potential, their biology discourages it simply through accumulated preference for experience over abstraction. Summers lost his job at Harvard because he lost the support of those necessary to perform his job properly. People who have positions such as college presidents have to play well with others. Being right or wrong doesn't not really matter. Summers should have expressed his opinion from a tenured professor position and not taken a job he could not perform up to the expectations of those who hired him. Well, obviously, but the material point is the same: when playing well with others is predicated on perpetuating a myth that is harmful. We need to change the myth. before dismissing milton's point, perhaps you should take a look at the paper titled "Gender and Mathematics Achievement in China and the United States". according to its abstract: "This study examines the relationship between gender and mathematics achievement among students in China and the United States, with an emphasis on the gender gap among mathematically talented students. The results show that in neither the US nor China are there gender differences in eighth grade math-achievement test scores. In China, there are no gender differences in mean college entrance examination math scores among high-school seniors, while in America, the mean SAT-Math score among male high-school seniors has been consistently higher than those of their female counterparts. In both the US and China, there are gender differences among the top math performers on college entrance examinations; boys are over-represented. The Chinese national mathematics curriculum, well-trained teachers, beliefs by students and their parents that academic achievement is more a product of effort than of natural ability, a gender-neutral parental expectation for children’s education, and generous family spending on the education of girls are suggested as possible factors underlying the comparable performance of the Chinese female and male students. The sorting system at Chinese secondary school level and a cultural stereotype favoring boys in mathematics are suggested as possible contributors to the math-achievement gender gap found among the top Chinese high school seniors." this study suggests that cultural attitudes toward gender may have some effect on performance, so we should be careful before dismissing that as a possible root cause. At 800, these people have maxed out the scale. If the SAT were able to measure higher levels of performance in math, we would expect the trend to continue and the ratio to increase. I would expect those with tenure in mathematics departments to score on the very high end of the scale. Of course, history has left its mark and it will take time to reach a new equilibrium. With the data, we just don't expect it to be 1:1. I'm 16. I just got an 800. I'm a guy. What can I say? Maybe the girls around me have tried harder than me. I didn't really shoot for a perfect score, it just fell on me. I wanted to do well, but I think it was all natural talent. Girls I know compete full-hearted (though still womanly) against boys, but still fall short. I actually get persecuted for doing so well by many girls. In the academic world, girls are like midgets trying to stone Goliath (symbolic of boys) into submission, while they could just get back in the kitchen and cook. Leave the deep thinking to us, girls! How about a girl who got an 800 on Critical Reading? How about girls in relation to Critical Reading? I'm a girl and I scored an 800 on the January SAT for CR.